Even though in the beginning of each season I tend to address my love for the four seasons, I can honestly say that this time I’m having some difficulties. The beginning of the darkest and coldest time of the year is just around the corner and warm and happy feelings are not the ones on top of my mind. Luckily, moving from Finland to Amsterdam has some benefits, as it’s not nearly as dark in here than it’s in Finland. But still I’ve been sensing the cold and grey weather lately. 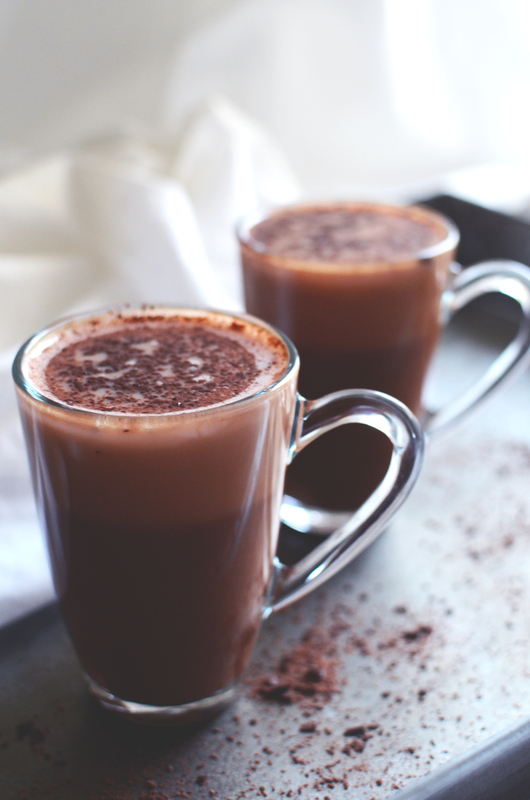 So in order not to fall into total despair, it’s time to take out the ’hard guns’ and make some hot chocolate! I’m a big fan of tea and tend to drink lots of it, but there are some situations when tea just is no enough and instead something stronger is needed. This is where the chocolate comes in. You already might have heard about raw chocolate and its many benefits, tried it or even made some yourself. It’s some pretty delicious stuff, I might say. Raw cacao was the first thing labeled as superfood that I tried a few years back and since then it has had it place in my cupboards. I like to use it for baked goods of for smoothies, but it also makes a really nice hot chocolate. Here I paired it with some cardamom and cinnamon, spices that make this drink even more warming. And on the top of everything, I like to put a piece of raw chocolate to the bottom of the glass, so that the last sips are mainly pure chocolate. 1. Add all the ingredient except honey and raw chocolate to a small pan. Cook at low heat stirring at the same time. Be careful not to let the milk get boiling hot. Now add the honey and mix well. 2. Put a couple pieces of raw chocolate to the bottom of each glass. 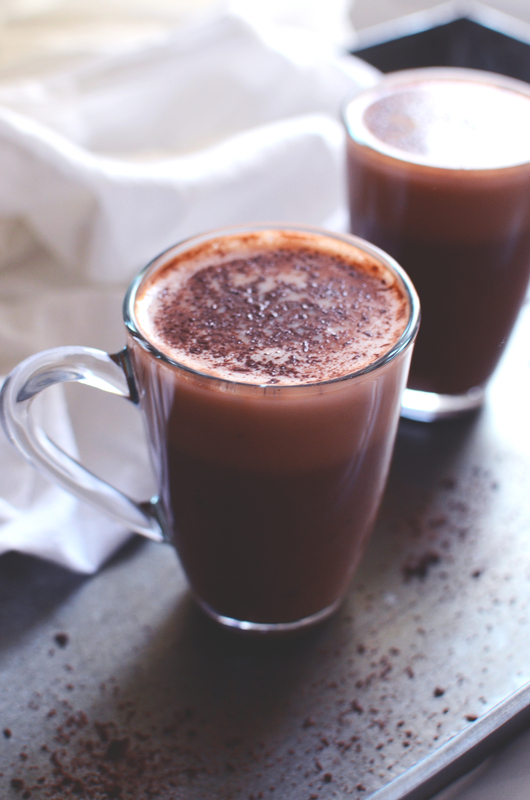 Pour the hot chocolate on top, sprinkle some more chocolate and enjoy. Tagged autumn, chocolate, treats, warm drinks, winter.